The perfect getaway for family or friends, No.8 Devon Beach Court has 2 bedrooms sleeping 4 people (+ cot), one with a large double bed and en-suite, the other with bunk beds. 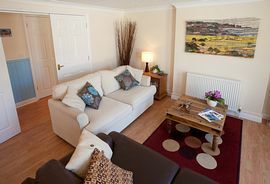 The light and airy modern apartment overlooks Woolacombe Beach, and offers comfort and style throughout. It is perfect for mini breaks or longer stays. Overlooking Barricane Beach, Devon Beach Court is right on The Esplanade in Woolacombe, only a short stroll to Woolacombe Sands. It is within easy walking distance of the village shops, post office, pubs and various wonderful restaurants. Children will love Devon Beach Court! 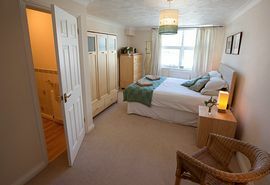 The twin bedroom has bunk beds, bean bags and a selection of childrens books, puzzles and toys and there is a selection of bodyboards, buckets, spades stored in the hall cupboard!. A high-chair is also available. Devon Beach Court is just as perfect for couples - (all toys are stored away out of sight) - just you, a luxuriously equipped apartment and the sound of the waves to lull you to sleep. The Living-dining areas contain a flatscreen TV with freeview, DVD player and VCR, a selection of books CDs, DVDs, puzzles and toys. There is a door entry system for doors on the ground and third floors. The kitchen includes a gas hob, electric oven, microwave, fridge-freezer and washing machine. A tumble dryer is housed in a cupboard off the hallway with the iron, various buckets and spades, body boards, wind breaks, airers and vacuum cleaner. Picnic ware for beach picnics is also provided. Bedroom 1 contains a large Double, with CD player and radio, dressing table, chest of drawers and wardrobe. It has an en suite shower room with shower cubicle, WC and basin. Bedroom 2 is equipped with the childrens' favourite beds: Bunk beds, together with a wardrobe (in which big squashy bean bags are located) and a chest of drawers on which sit suitable childrens' books. There is a good sized family bathroom with bath, WC and basin. 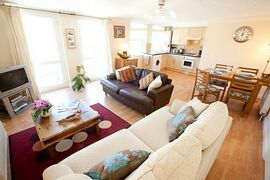 Outside there is a small terrace with sea views of Barricane Beach, and a further spacious communal terrace with glorious views across Woolacombe Beach to Putsborough and Lundy Island. An off-road parking space also comes with the Apartment. Woolacombe is a great holiday base for exploring the beauty of North Devon with Mortehoe, Ilfracombe, Barnstaple, Lynton, Croyde, Clovelly and Exmoor all close at hand. Many other family holiday attractions are within easy driving distance. Woolacombe is surrounded by National Trust land in glorious North Devon so, if you enjoy walking, there is an abundance of scenic walks from your door. Level access from road via lift. Access to communal terrace via lift. 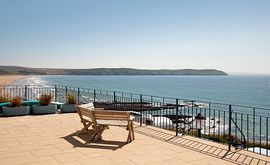 Balcony with sea views and spacious communal terrace for stunning sea views of Woolacombe Beach and Lundy Island. Body boards and buckets & spades in the property. Surfing & other watersports, riding, tenis and golf nearby. Local Services: Village shops, post office, pubs and restaurants nearby. Devon Beach Court is in Woolacombe, North Devon, about 12 miles north of Barnstaple. Full directions and key access information is sent to guests prior to their arrival. Prices are per week for up to 4 persons (plus cot user). They range from: £345 in the low season to £925 during the height of the summer. Short breaks (minimum of 3 days), are available between October and April. Bookings are managed on our behalf by Amanda, Harry and Rick at My Holiday Marketing who know the apartment well. 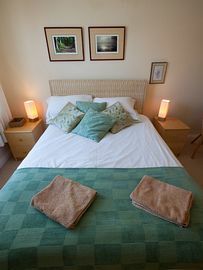 Online booking facilities are available from our Woolacombe Beach Apartment website. Arrival time: after 16:00 hours.